I fell in love with peaches…a year ago, exactly. I may sound very late to the party, but peaches don’t grow close to where I live, and finding juicy, ripe peaches had always been a frustrating experience for me, to the point that I’d completely given up. After biting into a life-changingly delicious peach last summer, I realized I needed more stone fruits in my life. I’ve since then practiced and mastered the art of ripening peaches on my kitchen countertop and figuring out exactly when they’re ready to eat. 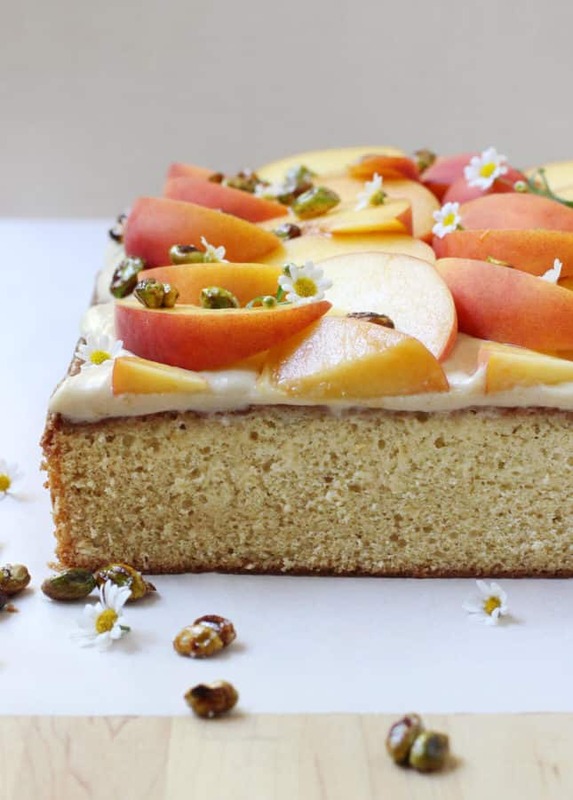 I’d been doing it for bananas, avocados, and mangos for years, so I’m not sure why I hadn’t included peaches in my finicky-fussy fruit club before. In any case, I’ve since then been eating and baking with peaches like my life depended on it. After all, I’ve got dozens of no-peach years to make up for! 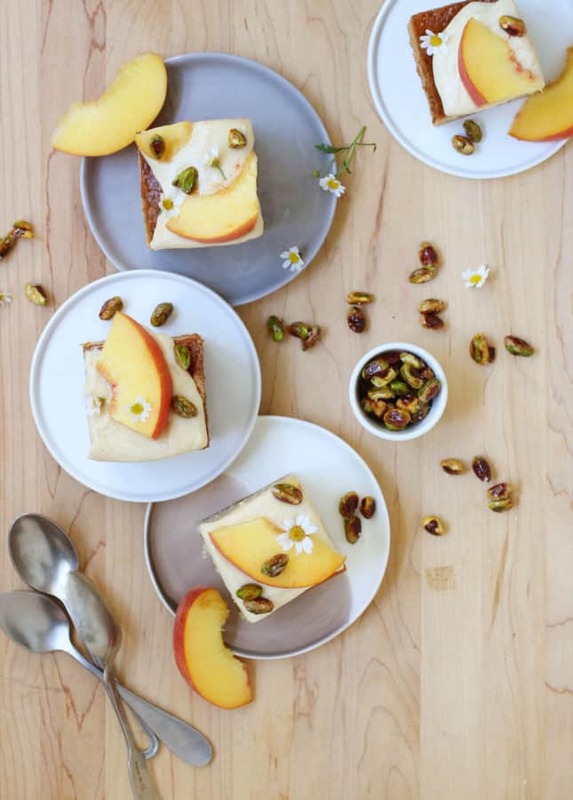 Today, I’m sharing my latest and best peach dessert yet: this Cardamom Sheet Cake with Salted Caramel Cream Cheese Frosting and Fresh Peaches. The name of the dessert is quite the mouthful, but each and every element is so delightful they’re all worth mentioning! Cardamom is a spice that has an intriguing earthy, herbal, slightly peppery flavor. In this recipe, you need to use a full tablespoon of cardamom in order for its delightful aroma to carry through the large cake. If you can’t find cardamom, you can replace it with 1 teaspoon (5 ml) of ground allspice, or 2 teaspoons (5 ml) of ground cinnamon. Dairy-free frosting option: I’ve tested making the frosting both with combinations of regular butter and regular cream cheese, and vegan butter and dairy-free cream cheese. I’m happy to report that both options work great: I’ve even served the dairy-free cake to unsuspecting guests, and they couldn’t tell the difference! Look for Daiya’s Plain Cream Cheeze Style Spread, which I think is the dairy-free cream cheese that tastes and behaves the most like regular cream cheese. How to tell when a peach is ripe: You’ll figure it out based on smell and touch. An underripe peach doesn’t smell like much, whereas a ripe peach smells like peach pie, or peach jam. Smelling it should make your mouth water. A ripe peach should also feel soft to your very gentle touch: it should give you the impression that you might easily bruise it by pressing it firmly with a finger. If peaches bruise simply by sitting on the counter or against one another, it means they’re overripe. They’re still amazingly delicious to eat, but they may be slightly too juicy and messy to use for topping this cardamom sheet cake. How to ripen peaches at home: After buying, transfer peaches to a bowl and let them rest on your kitchen countertop, checking on them twice a day. When I buy hard peaches at the grocery store, they usually take up to three days to ripen. Once peaches are ripe, they can turn to mush pretty quickly, so either eat or use them right away, or refrigerate them to slow the ripening process (make sure to use refrigerated peaches within two days). How to make peaches ripen more quickly: Place them in a paper bag along with a ripe banana, fold the bag shut, and leave it on your kitchen countertop. The peaches are likely to ripen in a single day, so make sure to check on them regularly to stop the process as soon as they are ready. About the Honey Candied Pistachio topping: I’m listing this topping as optional—but it’s required in my book! Candied pistachios only take a few minutes to make and add a delightful, salty crunch to the topping of the cardamom sheet cake. If you don’t have pistachios on hand, you can use slivered or sliced almonds instead. 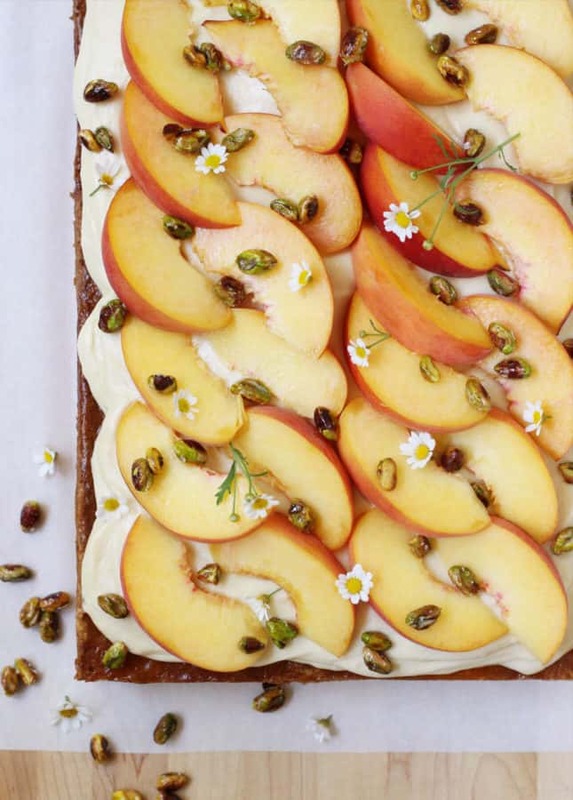 This cardamom sheet cake dressed with a salted caramel cream cheese frosting and aromatic fresh peach topping is a delightful way to feed a summer crowd. For the cardamom sheet cake: Preheat the oven to 325°F (160°C). Grease a 9 x 13-inch (23 x 33 cm) baking pan and line the bottom and two sides with parchment paper. 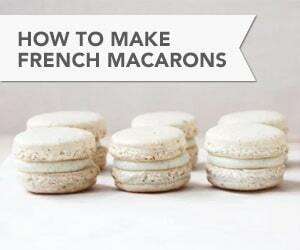 In a bowl, whisk together the flour, cardamom, baking soda, and salt. Set aside. In the bowl of a stand mixer fitted with the paddle attachment, or in a large mixing bowl if using a hand mixer, cream the butter and sugar together until light and fluffy, 2 to 3 minutes. Add the eggs, one at a time, and beat until incorporated, scraping down the sides of the bowl as needed. Add the vanilla extract and mix to incorporate. Add 1/3 of the flour mixture, and mix on low speed just to combine. Add the yogurt or sour cream and mix just to combine. Add another 1/3 of the flour mixture and mix just to combine. Add the heavy cream and mix just to combine. Add the remaining flour and mix just to combine. Use a spatula to scrape down the sides and bottom of the bowl and make sure all the ingredients are well incorporated. Transfer the batter to the prepared baking pan and use a spatula to spread it all the way to the sides of the pan and even out the top. 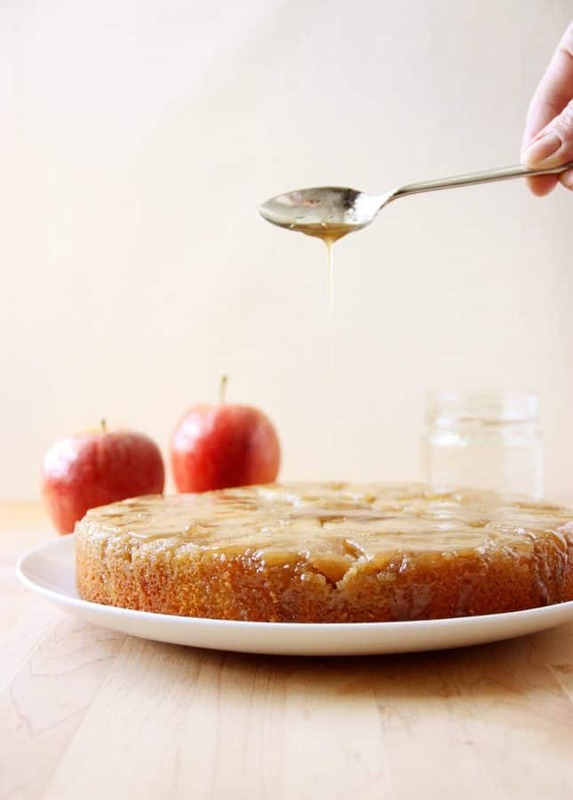 Bake the cake for 60 minutes, or until a toothpick inserted in the center of the cake comes out clean. Transfer the pan to a wire rack and let cool for 15 minutes. While the cake cools, heat the peach or apricot jam for a few seconds in the microwave or in a small saucepan over low heat to loosen it. If there are chunks of fruit in the jam, blend it using a hand blender or a mini food processor to make it smooth. Using a toothpick or a skewer, pierce the top of the cake all over. Pour the warm jam over the top of the cake and use a spatula to spread it in a thin layer over the whole surface of the cake. Let the cake cool completely, at least 1 hour. You can prepare the cardamom sheet cake one day in advance. When the cake is completely cool, cover the pan with plastic wrap and keep at room temperature or store in the refrigerator until ready to frost and dress. For the salted caramel cream cheese frosting: In the bowl of a stand mixer fitted with the paddle attachment, or in a large mixing bowl if using a hand mixer, beat the cream cheese and butter together until smooth. Mix in the salted caramel spread and salt. Sift 1 cup (250 ml) of powdered sugar into the bowl, then mix on low speed to combine. Sift another 1 cup (250 ml) of powdered sugar into the bowl, then mix on low speed to combine. Taste the frosting: it should be sweet, but not too sweet, with a clear salty note. Add more powdered sugar or salt, if you think the frosting needs it. Once you get the taste right, beat on medium-high speed for 2 minutes to make the frosting super smooth and fluffy. The frosting might be slightly loose at this point, but you want it to hold its shape on the cake. Refrigerate the frosting for 15 to 30 minutes to stiffen it some before spreading over the cake. Alternatively, you can prepare the frosting in advance, refrigerate it, and return it to room temperature 30 minutes before you want to assemble the cake. Give the frosting a good stir before spreading over the cake. For the honey candied pistachios: Line a large plate or a baking sheet with parchment paper. Place a small nonstick skillet over medium heat. Add the pistachios and toast the nuts for 3 to 4 minutes, shaking the skillet regularly. Drizzle the honey over and stir to coat the pistachios. Cook, stirring continuously using a spatula, for 2 minutes more. (Keep a close eye on the nuts to make sure they don’t burn. Lower the heat if necessary.) Transfer the nuts to the prepared plate or baking sheet, then use 2 forks to separate the nuts. Sprinkle with salt, then let cool completely. 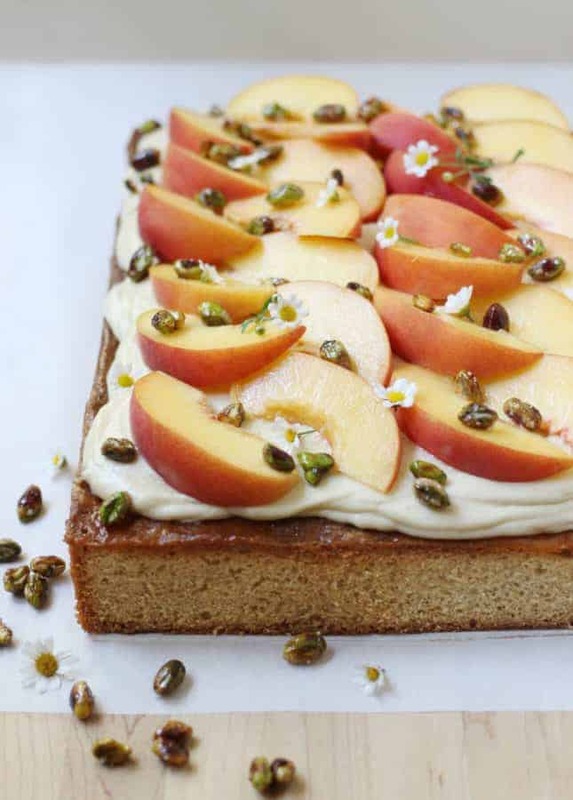 To assemble the cake: Halve the peaches, pit, then each half into 4 slices. 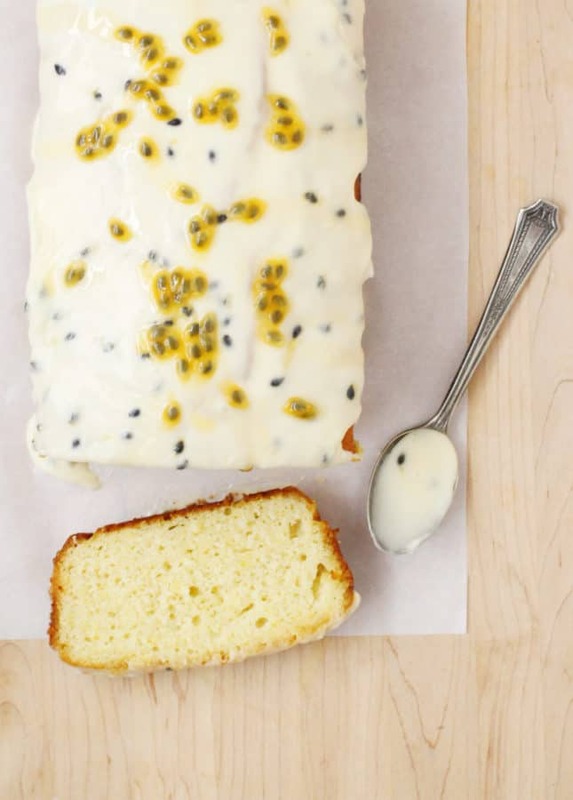 Slide a sharp knife all around the cardamom sheet cake, then lift the cake out of the pan. Transfer to a large serving plate or a cutting board. Scoop the frosting onto the top of the cake, then use an offset spatula to spread it all the way to the edges of the cake. 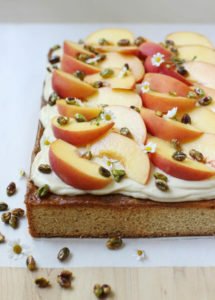 Arrange the peach slices over the frosting, overlapping them slightly. 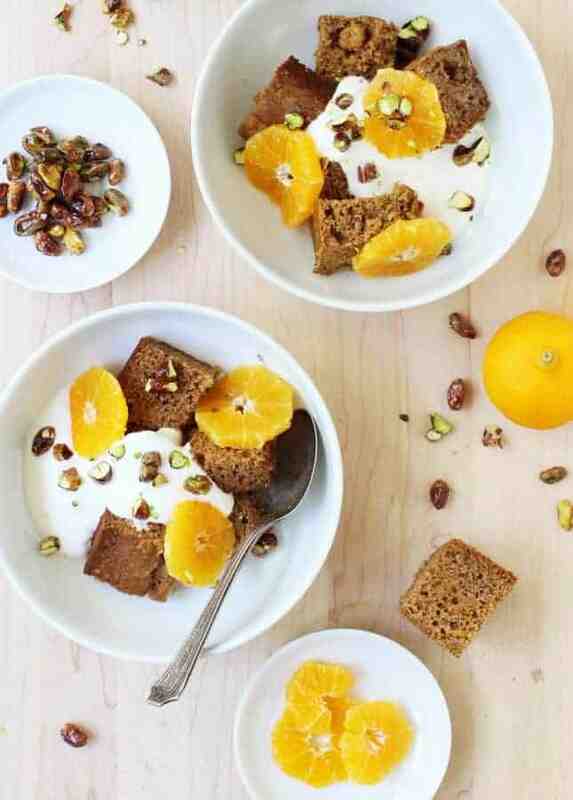 Sprinkle with honey candied pistachios. SERVING: To portion the cake, use a very sharp knife to slice right through the peaches. If the peaches you used are ripe, the job should be easy. STORAGE: Store leftover cake in an airtight container in the refrigerator for up to 3 days. Return to room temperature before eating. Recipe Credit: Marie Asselin, FoodNouveau.com. Cake recipe adapted from Sarah Kieffer, The Vanilla Bean Blog.